The earliest settlement of the town dates back to before Minoan times. εxcavations in the neighbouring site of Petras have unearthed architectural remains that date back to the end of the Neolithic period 3000 BC and continue throughout the Bronze Age 3000-1050 BC. In addition, there are several Minoan settlements unearthed in the various archaeological sites in the municipality, such as in Itanos and in Mochlos. 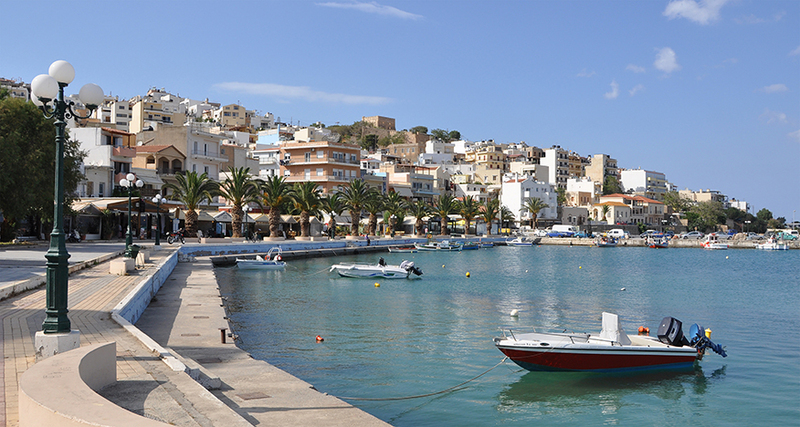 According to Diogenes Laertius, Sitia was the home of Myson of Chen, one of the Seven Sages of Greece. In the Venetian Era, the town was expanded and fortified by the Venetians who used it as a base of operations for the Eastern Mediterranean. During the Venetian occupation, the town was destroyed three times: by an earthquake in 1508, by a pirate attack in 1538 and finally by the Venetians themselves in 1651. Sitia was then conquered by the Ottoman Empire. Toplou Monastery or Monastery of Panagia Akrotiriani is one of the most important and beautiful monasteries in Crete. The monastery with its imposing belfry, 33 metres high, stands in a harsh, almost desert landscape. Toplou Monastery is impressive from afar, looking like a small fortress surrounded by a 10-metre-high wall. 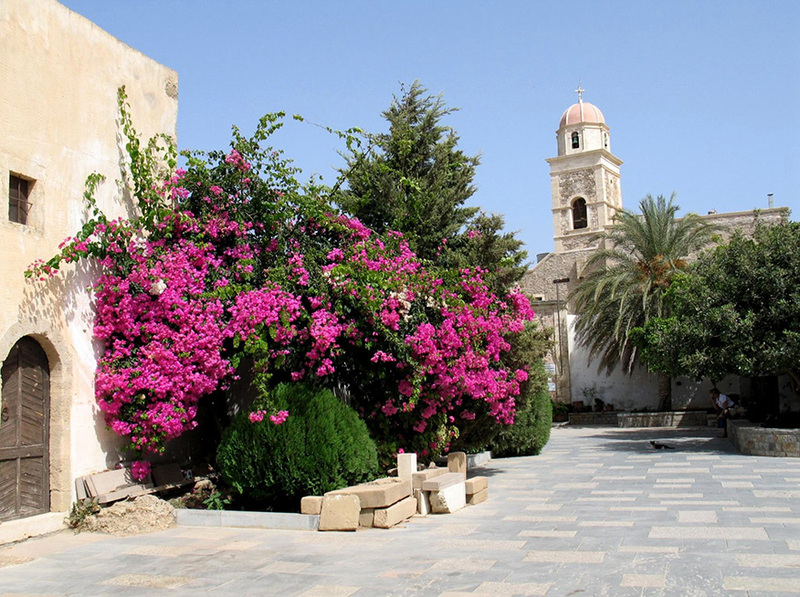 Toplou Monastery is the only surviving example of the many monasteries, large and small, that once stood in the Sitia area - all eventually destroyed by war and pirate raids. Abbot Philotheos Spanoudakis has been active in organising and promoting the monastery. Among other things, he has established a Museum of Copperplate Engravings and Greek Folk Engravings produced by the monks of Mount Athos in the 18th and 19th centuries. The monks created images of everyday life as accurate as photographs. Toplou Monastery houses 15th-century icons which, along with other, later examples, are of great artistic interest as they show the stages of development of the Constantinople School of art, which influenced Cretan art. The icons of Toplou Monastery are priceless and demonstrate the monks’ truly impressive level of education. The unique icons on display in the monastery today include works by Ioannis Kornaros, the icon “Great Art Thou, O Lord, and Wonderful Are Thy Works” dated 1770, the “Unwithering Rose” dated 1771, and the icon of St Anastasia Pharmacolytria (“Deliverer from Poison”). Apart from the wonderful icons, other objects on display in Toplou Monastery include ecclesiastical items such as Gospels, silver-gilt crosses, Patriarchal Sigils, Sultan’s Decrees, seals, revolutionary banners and vestments. The monastery dining hall is decorated with wall paintings by Manolis Betinakis, while in the courtyard is a recent sculpture by artist Manolis Tzobanakis. Set into the façade of the monastery church you will also see the ancient inscription of the “Arbitration of the Magnetes”, referring to the rivalry between the cities of Itanos and Ierapetra over the island of Leuke, a major sponge-fishing and murex-processing centre of ancient Crete. Vai, or more specifically the palm forest of Vai, is one of the most popular sights in Crete and one of the most beautiful and special places in the whole Mediterranean. Vai draws thousands of visitors each year. They come not only for its wonderful palm forest, but also for the large sandy beach spread out at its foot. 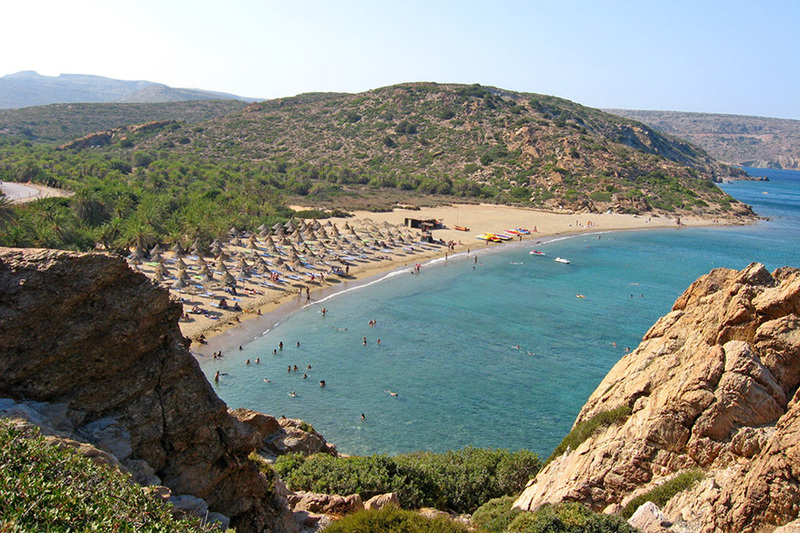 You really must visit Vai if you’re in Crete, especially in the east of the island. It’s just like a tropical beach, with its palm trees and small islet in the middle of the bay. The palm forest of Vai now covers an area of approximately 250,000 square metres, making it the largest palm forest in Europe. The beach and palm forest of Vai is also fascinating for its biodiversity, as many migrating birds stop here on their voyage to and from Africa.